Death is an uncomfortable situation for everyone. The fact that it is a natural does not make it easy to accept. However, the dramatic ways the funeral practices are held in many cultures makes it seems so unnatural and nonsense. I belong to a Punjabi family and recently my grandmother expired and just like every other grandchild it was a mere shock to accept it but what made me dumb struck were the things that happened during those rituals. So Here is the list of things or I would say rituals that do happen which are really really very weird and unacceptable for someone who has lost their beloved, but yet they exist and also practised. It really did not make any sense for me when I saw my elders planning for a grand bhoj on the day of death, 4th day called chautha & 13th day. The fact that it was equally depressing and shocking to bear that loss and to plan that grand feast at that moment seems utterly nonsense for me. Not just the feast there is also the custom of giving money to the daughters of the family and when I saw everyone planning about the same I felt the tsunami of anger inside me.I understand that is necessary to donate money to temples and religious places but the way grand planning was held to give money to the family members seem utter non sense to me. 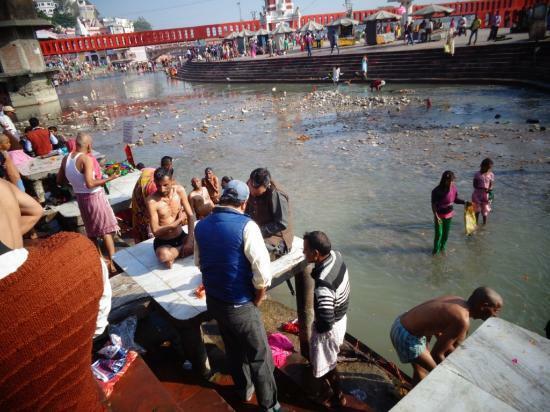 From donating umbrella to bed to shoes to money the way these funeral practices are done in Haridwar it seems like these religious pundits are no less than the money gurus playing with the faith of people in the name of making business. I know it is very difficult to control our pain, emotions at this time, but when over dramatic people comes at the funeral ceremony and present their overacting skills in expressing their emotions, it seems really weird.